The Project’s past events are listed on this page. See the Event Reports page for all resources associated with the events organised and coordinated by this project. The final programme is now available for this two-day conference. Conference location: All conference sessions and breaks will be held in Room PL2, The Pontio Centre, Bangor University (#48 on the map below). Pontio is the new Arts and Innovation Centre in Bangor. It is on Deiniol Road, Bangor LL57 2TQ, about 5 minute walk straight down the road from the train station. Coffee and tea will be available there from 2:00pm on Friday for registration. A full Bangor University Location Map can be downloaded here. Directions and map just for the Pontio building are here. These maps include car and train travel suggestions. Contact: My office phone number is (0)1248 388628. You can also reach me on my mobile number: 07789 513878. Alternatively, you can phone the School of Creative Studies and Media: (0)1248 388560. Conference Dinner: The conference dinner will be held in the Cledwyn Room in the Main Arts building (#51 on the map below). Travel to the top of the Pontio Building and out the back entrance. Enter the Main Arts Building and Cledwyn is at the end of the long hall. Signs will be posted. Parking: If you are arriving by car, you can park in the University lots for free. Please email Emma Thomas (emma.l.thomas@bangor.ac.uk), the School administrator, with your car make and license number and she can arrange for a parking permit to be available for your use. Workshops: If you are attending one of the workshops, you will need to make your way to John Phillips Hall on College Road in Upper Bangor. (#63 on the map below). This is also the home of the School of Creative Studies and Media. Presentations: PL2 has full internet and projection facilities. We can support presentations from your laptop, USB stick, or online. If you have any special presentation needs or concerns, please get in touch. Twitter: The hash tag we will be using is #AcBookBangor. WiFi: WiFi will be available and login advice will be provided at registration. How will profound changes in publishing affect the Academic Book of the Future in the South? 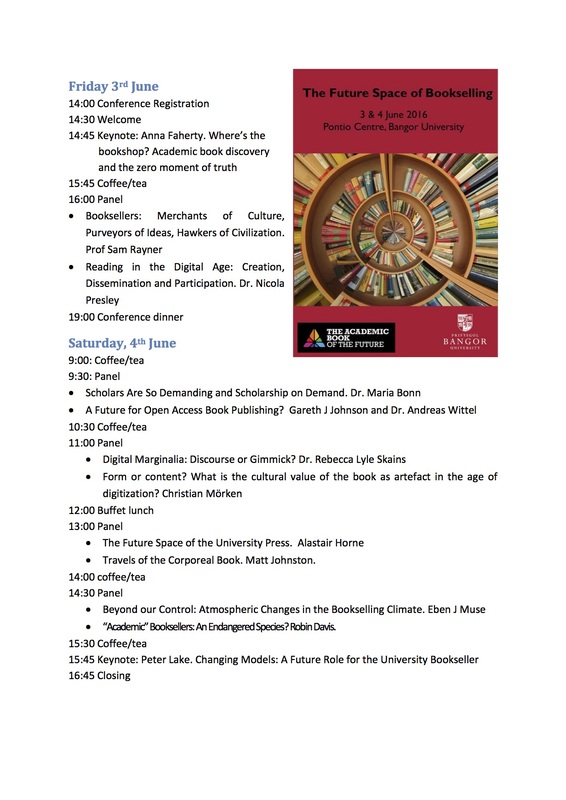 A two-day conference organised by the British Library in collaboration with Professor Marilyn Deegan (The Academic Book of the Future project) and Dr Caroline Davis (Oxford International Centre for Publishing Studies, Oxford Brookes University). The conference is a partnership between the British Library and the Academic Book of the Future project. Speakers including publishers, librarians, scholars and authors, will address the production, dissemination, reading and reception of the academic book with specific focus on Africa, the Middle East and South Asia. The conference will consider, among other things, how scholars’ ability to access and produce knowledge is facilitated by digital technology and how academics can play a more active role in the creation of, and access to, books in the Arts and Humanities, both printed and digital. It will appeal particularly to scholars and practitioners with interests in authorship, publishing and librarianship and the history of the book. The space and place of the bookstore has shifted dramatically over the past fifty years. The traditional physical space of the Indies, chains, market-stalls and superstores now create a common place with virtual stores, eReaders and tablets. This is largely due to digital technologies that have removed problems of distribution and access as well as fundamentally called into question what it is that is being bought and sold and who owns that item being exchanged. The academic book has always had its own “space”: its own audience, its own distribution networks and its own purposes. Academia depends on the book as a dissemination and teaching medium, yet today many university campuses and towns no longer have bookstores. The academic space of the book has either closed or moved to a new place. This conference will consider what these new places may be, the impact this move has had on readers and booksellers, and the changing relationships that have always developed within the space and place of the book. The place of the book: the stores (brick and mortar or on-line), the network (social or otherwise), the device. Proposal ideas that extend beyond these thematic areas will also be considered. Proposals, of no more than 250 words, should be submitted to Dr Eben Muse (e.muse@bangor.ac.uk) and Rebecca Lyons (rebecca.lyons@ucl.ac.uk). This conference is jointly sponsored and organised by the Arts and Humanities Research Council/ British Library funded project, The Academic Book of the Future, and the School of Creative Studies and Media at Bangor University. The Conference dates have been moved to 3-5 June. This is to accommodate attendees who also wished to attend the Academic Booksellers Conference (16-18 March) and the London Bool Fair (12-14 April). ePub 3 a vision of the future – how are we going to get there? Including a keynote by Catherine Grant from the University of Sussex, a highly respected champion and producer of the video essay format, as part of the event schedule, participants will have the opportunity to explore the Festival trail throughout the city, and will be offered complementary tickets to the provocative and immersive digital projection extravaganza at Lincoln Castle as the final event of the magnificent Magna Carta 800 anniversary celebrations. Find out more here, including how to register. The Centre for the Comparative History of Print (Centre CHoP) present this seminar as part of the Sadler Series, Cultures of the Book. Simon Tanner, from King’s College London, (Co-Investigator on the Project) uses REF 2014 data to consider the state of the academic monograph. Looking both at the proportion of books submitted across the subject panels and then in depth at English and History, Tanner reflects on the role the monograph plays in the economy of scholarly communication and discusses the challenges the monograph will face in the future. This seminar will be preceded by the Centre CHoP AGM, 4-5pm. Arranged with Jim Mussell. Panellists Professor Andrew Prescott (University of Glasgow, AHRC), Dr Bronwen Thomas (Bournemouth University), Professor Miri Rubin (Queen Mary University of London), and Dr Sara Perry (University of York) discuss when, how, and where academics and their audiences read in the digital age. For more information and to register, follow the event link above (registration is free). Part of the British Library’s Digital Conversations series. Rebecca Lyons speaks at this event, on the invitation of Prof. Thomas Corns (Bangor), on the Project’s Advisory Board. 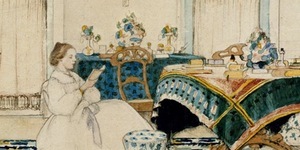 Chair of the Project’s Advisory Board, Kathryn Sutherland (Oxford), speaks at the Books and/as New Media twinned symposia event at Harvard University (14-15 May, Houghton Library) and the University of Edinburgh (9-10 July, 50 George Square). For more information, and to read abstracts, visit www.chb.ed.ac.uk. A one-day workshop at RMIT Europe in Barcelona, connecting the Project with anthropologists and digital ethnographers, and asking about the ethics of circulation with regard to the academic book of the future. Visit the event page above for more information, the workshop programme, and the Storify of the workshop’s Tweets. The aim of this workshop is bring together interested parties from a number of communities to debate the future of the academic book. The Project invited academics in the arts and humanities, librarians and publishers to join us for a series of short presentations followed by focus group sessions. Hosted in collaboration with the University of Manchester Library, Manchester University Press, and Digital Humanities@Manchester. Visit the event page above for the workshop programme. Project Manager Rebecca Lyons speaks about the Project at the half-day conference ‘Networks of Book Production and Circulation 1400-1600’, at the University of Bristol on Wednesday 29th April, 1-5pm. PI Dr Sam Rayner delivered a seminar on the Project to UCL Department of Information Studies doctoral students, encouraging involvement in the Project. PI Dr Sam Rayner speaks at the ALPSP Seminar. For more on the Project’s involvement in this event, visit the event page above.